Heather Giustino Blog: Awesome Giveaway - Whisker Graphics! Awesome Giveaway - Whisker Graphics! Happy Monday, everyone! I hope you had a great weekend. To ease the pain that is Monday, I have a fabulous giveaway for you today from Whisker Graphics! Whisker Graphics is a Bay Area-based (Danville, specifically!) company that specializes in gorgeous baker's twine, customized printables, paper goods and adorable packaging! How cute would this bitty bag be, tucked inside a lunch box with a little love note? 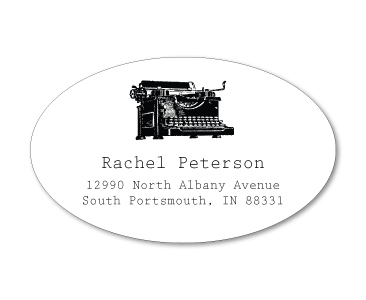 I also love these oval typewriter labels, which are available in a dozen beautiful colors! And how cute are these dress form cards with matching labels?? Swoon! So, what's up for grabs? One lucky person will be getting a $30 gift card to Whisker Graphics! All you have to do is tell me what you'd use your money for. Want bonus entries? Go leave a comment on their blog letting them know I sent you. Come back here and leave a comment letting me know you did. For an additional entry, go "like" their Facebook page and let them know I sent ya. Come back and comment letting me know that you did. Good luck! Winner will be picked next Monday, August 15 and announced on Tuesday, August 16. I would get some of that fantastic bakers twine! Oh, I love Whisper Graphics! I'd use the money for some twine, and some of those cute little bags! I let Whisker Graphics know you sent me on their FB page! I would use $30 at Whisker Graphics for baker's twine and cute little bags! Hi Heather! Thanks for the chance to win the $30.00 gift certificate! If I won, I would probably spend the whole thing on that adorable bakers twine because I don't have any and I love it! I would totally use it to buy one of their great spool trios! I would use the money for the Bakers Twine!! I am a cardmaker and scrapbooker and love using the twine in my projects!!! I would spend it all on their twine!! I commented on their blog!! I've been a FB fan, thats how I found out about this giveaway! I would love some of their scrumptious twine and bitty bags. "Like" Whisker Graphics FB page! I visited Whisker Graphics and told them you sent me over for a visit. I let Whisker Graphics know that you sent me to their facebook page for a visit. I'd use my winnings for Baker's Twine and their cute treat bags! WooHoo! Let's go shopping! I would get some twine! Everyone seems to be using twine with their crafts and I want to jump on the bandwagon. I left a post on Whisker Graphics blog! I would spend it like mad - all on the twine!! I left a post on Whisker Graphics facebook page! I would love to win! I have a scrapbook page that I want to make a rainbow on! I'd get some of their Grid Bitty Bags, maybe the metal rimmed tags, and definitely some twine- licorice, brown sugar and orange for Halloween. I'm a FB fan of Whisker Graphics. I commented on WG's Print & How Magazines – Hot Deal blog post. What a great giveaway! I'd get some gorgeous twine for sure! I would definitely use the money on bakers twine. They have such great product and I use the twine on cards and scrapbook pages! It really makes a huge difference. AANNDDD... I am already a huge fan of them on Facebook. :) But I let them know you sent me over! If I were lucky enough to win it would be ALL about those bitty bags and twine! And I am already a HUGE fan of Whisker Graphics on Facebook! And I went over to the WG blog and told them you sent me! Iwould spend my chance on the twine and those bags, how cute are those!!! I would have to get some twine and those dress form cards are screaming my name! Thanks for the great giveaway! OOOOOhhhhh!!! Thanks for the giveaway! I would definitely but some of their yummy twine!! Love it!!! I left a comment on their facebook page! I already liked them too!!! Ohhh...I would get mini file folders and recepie cards. Such cute stuff! Just left comment on whiskergraphics blog! I would like Orange Divine Twine, and some bitty bags too. I think I'd def get my hands on some baker's twine - love the stuff! Liked their page on facebook and told them you sent me! I would definitely get some baker's twine! soo cute! I love their cute stuff. I just got married so I'd love to get new address labels with my NEW last name. 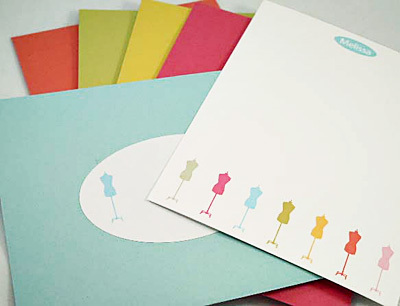 I love the Blossom Silhouette personalized flat notes... and so many great colors! since I run a little etsy shop, I love using twine & labels to jazz up my goods, so this would DEFINITELY help me out. I would love some of those oval labels. SO CUTE! i am craving that TWINE. that is definitely what i'd pick. or some of the adorable stationary. i'd get the divine twine, definitely! i follow them now and told them you sent me! I would totally use the twine since I am about to start my own etsy shop! Oh my, do I really have to choose?! I might want to add some lovelies to my stationery collection - the 'birds in a row' cards are so sweet! Wow! What a great giveaway! I didn't know they were local! I already follow them via FB but would love a chance to win! Thanks, girlie! the Twine....every color is lovely! I would get the Polka Dot Bitty Bags & Mod Flower Oval labels. Would be perfect for my daughter's birthday party! Oh I think I would get some bitty bags (the Chevron ones are adorable) & some baker's twine! Following & commented on the blog! Just liked them on FB and wrote on their wall. I would either get twine or some new labels. Such cute, cute things!! Oh, definitely Baker's twine for gifts and such! I would love to win this and finally get some of their amazing twine! I commented over at their blog to say... I love baker's twine!! I think I would get labels and try some twine also. It's an awesome site! Fabulous giveaway!!! I love the Calligraphy Swirl Oval Labels and the polka dot bitty bags and the cherry divine twine. Just left a comment on Whisker Graphics blog. I would love to use the $30 to get some bags for the cookie buffet we're having at our wedding! I'm following the blog and just commented on it! I liked them on Facebook and posted on their page! If I won I think I'd buy some of the bags. They are so darned cute!! I said hi to Whisker Graphics for you!!! Oh how I love their twine!! I would be buying some twine and those cute little bags!! I told Whisker Graphics on FB that you sent me to say hi. I'd love to buy some twine! Thanks for the chance to win. i adore whisker graphics! i bought a sample pack of twine recently & fell in love. i also covet the notebook bitty bags... perfect for the new school year. thanks so much for the chance to win! I commented on their blog. I let Whisker Graphics know you sent me to their facebook page. Thanks. I would buy twine and small bags. Love them. I let Whiskers Graphics know you sent me. Oooh... with $30? I would definitely buy some of those adorable bitty bags! I love the hostess pattern! 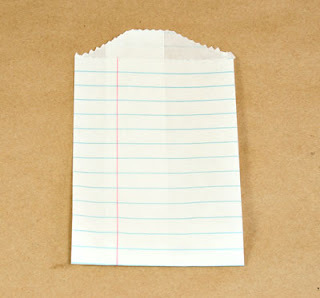 I would definitely get some Divine Twine and some small bags with the binder paper lines. I like and commented on Whisker Graphic's FB page! I posted on WG's blog post! oh! i would love it all! but if i had to pick it would be the little bags! they would sure come in handy for my daughters party! thanks for the chance! I love that bakers twine! I'm a fan of their FB page! and I would totally use their twine to gift wrap prezzies! I love their product! I would use it for twine! Love this stuff! Thanks for a great giveaway!! I went to the Whisker Graphics blog and left my comment. Thanks. I am a fan of both your blog and Whisker Graphics and their FB page. Thanks! well, being that I just spent $160 to get ALL the colors of that beautiful twine, I would spend the money on the itty bitty gift bags and some round seals to close them up with. I left a post on Whisker Graphics blog saying you sent me! I like Whisker graphics on FB. I told them you sent me! 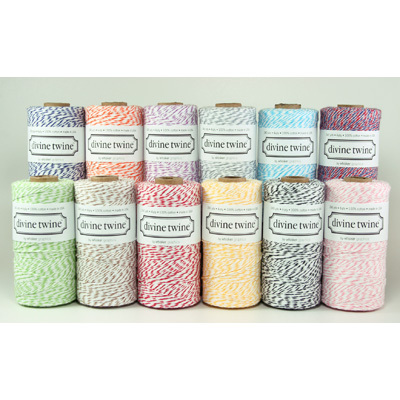 Divine twine and some sweet labels! I'd use the twine as a tie for one of the cute labels to attach to my child's lunch box each day! i would love me some of that divine twine!